To celebrate 150 years since the publication of Alice’s Adventures in Wonderland, Rural Reads Plus chose the book for their February meeting. For many of the group it meant rereading the book and revisiting childhood memories. I always enjoy rereading childhood favourites; when we read Wind and the Willows in February 2011, there was so much discussion and so many memories shared. Alice’s Adventures in Wonderland is still a constant part of our popular culture, and only a few years ago there was a new film adaption starring Johnny Depp in the cinemas. I found it fascinating to reread the actual story and see if my memory of it had been altered by so many interpretations. I’m sure most people know the Alice story, but here’s a brief overview. A young girl called Alice falls down a rabbit hole and into a strange world of eccentric characters all living under the tyranny of the Red Queen. It’s the strange and eccentric characters that really make the book so memorable and fascinating, not just to the wild imagination of younger readers but also by highlighting the familiar characteristics of real people these characters portray. One of the pleasures of the rereading this book is the illustrations. The most famous and recognisable are the original illustrations by John Tenniel, who was an artist for Punch. 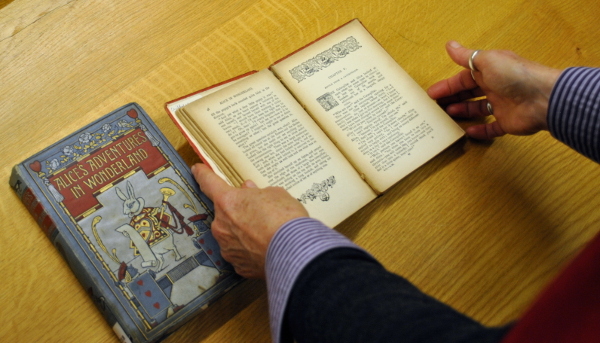 Of course our vast and amazing Special Collections have some editions of Alice’s Adventures in Wonderland, and our Librarians displayed some interesting editions, including Russian and Latin translations. Each of these editions had their own unique illustrations, which proves how much of a visual and colourful book this is. The character of Alice sums up British attitudes during the late 19th century, and Alice’s obnoxious and fearless attitude provides an insight into contemporary British ideas as well as those of the Empire. As a character the group found her annoying; we felt she was used as a catalyst rather than a sympathetic endearing character. We all enjoyed rereading – and for some of us reading it for the first time – as we all remembered the book as vignettes rather than a whole story. The story of Alice and the characters she meets are so enduring and continue to fascinate and enthral us. I was recently in the children’s section of a book shop looking for a copy for my niece, and I was spoilt for choice. 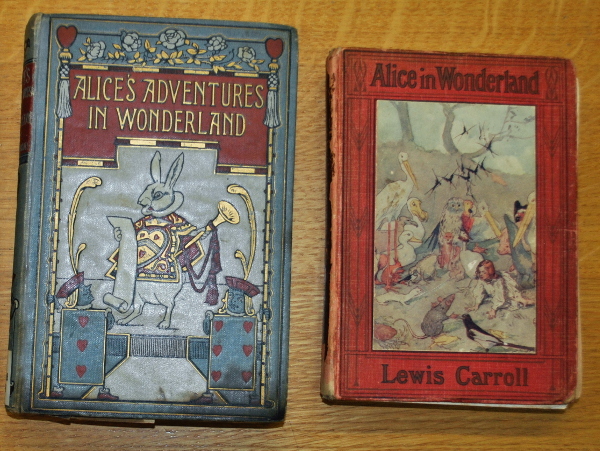 From popular films, pantomimes to even appearing in rock music (I’m sure we all remember Jefferson Airplane’s ‘White Rabbit’ – available on YouTube), Alice’s Adventures in Wonderland continue to play a significant part in our popular imagination. The next book we’re reading is Winter Sonata by Dorothy Edwards, and we’re meeting on Thursday 26 March at 5.30pm. If you are passing the University Library on the Whiteknights campus, please do have a look at our new exhibition in the display cases on either side of the lifts in the Library foyer. 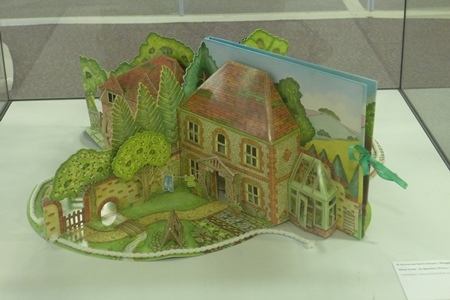 Come to the farm : children’s books on farming is a celebration of books on farms and farming for children selected from the Children’s Collection, part of the University of Reading rare book collections, and the library of the Museum of English Rural Life. 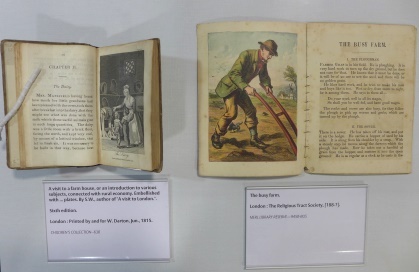 The exhibits range from an early nineteenth century book on farming and ‘rural economy’ for children [see item on the left in image above] to a twentieth century pop-up book of a Victorian farmhouse [see image below]. 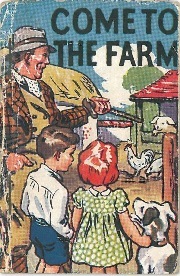 The exhibition also features a selection of Ladybird books on farms and farming from our Ladybird collections. 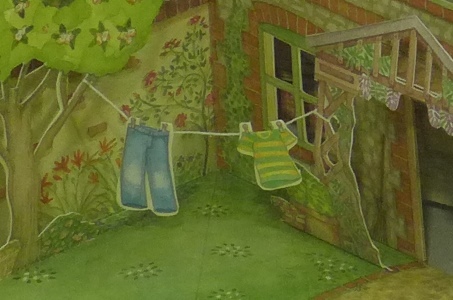 Look out for the pop-up book farmhouse, complete with a tiny washing line on a piece of thread [see image below]! The exhibition will be on display at the University Library from 9 February until 17 May 2015, and then transfer to the Special Collections Service staircase hall from 18 May until 17 July 2015. Georgia Charitou, intern from Greece, shares some further highlights from her work on the Stenton Coin Collection, which spans the 7th to the 20th century. Previously: Bloodaxe, Vikings and other early coins. Today Constantine to Victoria! Constantine X Doukas was Emperor of the Byzantine Empire from 1059–1067. During his reign he issued silver and copper coinage bearing the portraits of himself as well as the portraits of his powerful wife Eudocia Makrembolitissa. Constantine was the first emperor since the second reign of Justinian II to consistently depict himself full-length on seals, beginning from the eighth century CE. This is a Histamenon nomisma, showing on the one side an enthroned Christ and on the other side the emperor standing on a footstool, wearing a loros and holding a labarum (a type of scarf and a military standard). Elizabeth I was Queen of England and Ireland from 17 November 1558 until her death in 1603, variously referred to as The Virgin Queen, Gloriana or Good Queen Bess. She was the fifth and last monarch of the Tudor dynasty. Elizabeth’s reign is famous for the flourishing of English drama, led by playwrights such as William Shakespeare and Christopher Marlowe. The Queen is sometimes depicted as a short-tempered and indecisive ruler but is also acknowledged as a charismatic performer and a dogged survivor in an era when government was ramshackle and limited. Coins like this were minted in Angel, Half Angel and Quarter Angel denominations. On the obverse is the Archangel Michael slaying a dragon. The reverse shows a ship holding a quartered shield with a cross above. Alternately, the pattern may represent the bowsprit of a ship heading directly toward us, with a quartered shield. Charles I was monarch of the three kingdoms of England, Scotland and Ireland from 27 March 1625 until his execution in 1649. Controversy and dispute dogged Charles throughout his reign. This eventually led to war, first with the Scots from 1637 and later within England itself (1642–46 and 1648). This Charles I half-crown was struck from a piece of hammered silver plate during one of the Civil War sieges of Newark, Nottinghamshire. The coin has a diamond shape and on the obverse has a crown with three crosses, and on the reverse has the inscription ‘OBS, NEWARK, 1646’. The half-crown was first issued in 1549, in the reign of Edward VI. No half-crowns were issued in the reign of Mary, but from the reign of Elizabeth I half-crowns were issued in every reign except Edward VIII, until the coins were discontinued in 1967. During the reign of King Charles I silver half-crowns were issued, including those struck out of necessity during the Civil War period. Mary Queen of Scots turned her attention to finding a husband and producing an heir at age 37, thus preventing the Protestant Elizabeth from succeeding to the throne. Edward Courtenay and Reginald Pole were both mentioned as prospective suitors, but her cousin Charles V suggested she marry his only son, Prince Philip of Spain. Philip had a son from a previous marriage, and was heir apparent to vast territories in Continental Europe and the New World. After about six weeks after her accession, Mary took the first public step in monetary policy by issuing a proclamation, in which she declared her intention of providing ‘coynes as well as gold as of silver of the perfect fineness’. After her marriage to Philip of Spain a similar coinage of base shillings and groats was produced, dated in Arabic numerals. The Shilling depicts on the obverse side Philip and Mary facing each other and on the reverse there is the emblem of their reign. Victoria was Queen of the United Kingdom of Great Britain and Ireland from 20 June 1837 until her death in 1901. Her reign of 63 years and seven months, which is longer than that of any other British monarch and the longest of any female monarch in history, is known as the Victorian era. Her reign was a period of great cultural, political and military change within the United Kingdom which saw a marked expansion of the British Empire. This specific coin is a copper halfpenny which depicts on the obverse Queen Victoria and on the reverse a triskelion, composed of three armoured legs with golden spurs. The triskelion has been the official flag of the Isle of Man since 1931, situated in the Irish Sea, midway between England, Scotland and Ireland. Although the isle has been a dependency of the British Crown since 1765, it was only through the Act of Tynwald (the island’s parliament) that its currency was superseded by British Imperial coinage from 1840.